It’s that magical time of year everyone at the Seattle Opera offices looks forward to…. No, no, not the holidays. It’s time to announce our 2012/13 season! 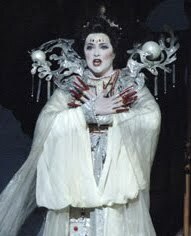 Soprano Lori Phillips (pictured here in Nashville Opera’s 2006 production of Turandot) stars as Turandot on opening night. Next year we’ll present six operas that explore the infinite variety of love, beginning in August with Puccini’s extravagant final masterpiece, Turandot. It’s a grand romance, set in legendary China, and tells the story of a cruel princess softened by love. And, of course, it features one of opera’s most famous arias: the emotional “Nessun dorma.” On opening night, soprano Lori Phillips takes on the role of the icy Turandot, opposite Italian tenor Antonello Palombi as Calaf. (By the way, you can also see Palombi in our upcoming production of Attila, opening in just a couple weeks!) For more info on the production and a more complete cast list (including bios, headshots, and audio clips), visit our Turandot webpage. Seattle Opera’s 2003 production of Fidelio. In October, Seattle Opera revives its 2003 production of Fidelio, created by the innovative team of director Chris Alexander and designer Robert Dahlstrom, who set the action in a present-day first-world prison. Beethoven’s only opera, Fidelio remains a story of hope in the face of oppression and tyranny that is as relevant today as it was in 1814. On opening night, German soprano Christiane Libor makes her U.S. operatic debut as Leonore, a devoted wife determined to find and free her wrongfully imprisoned husband, Florestan. 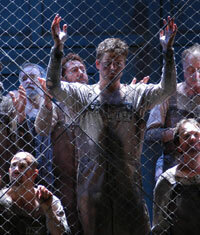 Singing that role is tenor Clifton Forbis, whose recent Seattle Tristan inspired rave reviews. Two Seattle favorites run Fidelio’s prison: bass Arthur Woodley is head-jailer Rocco, and bass-baritone Greer Grimsley is the cruel governor Don Pizarro. For more info, click here. The whimsical sets/costumes come from Houston Grand Opera. 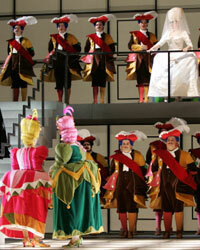 Rossini’s effervescent take on the Cinderella story returns to Seattle Opera in January 2013. This charming production of La Cenerentola brings the family-friendly fairy tale to life with eye-popping colors, magical conveyances, and a helpful team of giant mice. Italian mezzo Daniela Pini and American tenor René Barbera make their Seattle Opera debuts as Cenerentola and Prince Ramiro on opening night. Also making their company debuts are Karin Mushegain and Edgardo Rocha, who take on those roles for two of the performances. 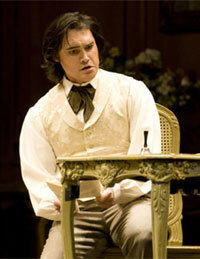 Tenor Francesco Demuro (pictured here as Alfredo in Seattle Opera’s 2009 Traviata) stars as Rodolfo on opening night. Another Puccini masterpiece comes to Seattle Opera in February and March 2013: La bohème, directed by Tomer Zvulun and conducted by Carlo Montanaro. You may remember Zvulun from his company debut last season, directing a stunning Lucia di Lammermoor. Montanaro also made his company debut during 2010/11 (Don Quichotte) and you can see him in the pit again in a couple weeks when we open Attila. On opening night Francesco Demuro returns as Rodolfo, with Elizabeth Caballero as his ill-fated Mimì. Norah Amsellem and Michael Todd Simpson, who both appeared in Seattle Opera’s recent Carmen, return as Musetta and Marcello. The alternate cast features the debuts of Michael Fabiano as Rodolfo and Nadine Sierra as Mimì. For more info, click here. Soprano Nuccia Focile stars as Elle in La Voix Humaine. The season wraps up in May with a double bill of important twentieth-century one-act operas, both new to Seattle Opera: La voix humaine, by Francis Poulenc, and Puccini’s Suor Angelica. Nuccia Focile returns for this 40-minute monodrama in which a woman desperately tries to stay connected to a former lover on the telephone. In Suor Angelica, a woman is forced by her wealthy family to abandon her illegitimate son and join a convent. Maria Gavrilova makes her company debut as the suffering young mother, with Rosalind Plowright returning as her chilly aunt. For more info, click here. Single tickets for select performances won't go on sale until May 29, but you can secure your seats now as part of a subscription package. Visit our website, or give the friendly folks at our ticket office a call (206-389-7676) and they'll be happy to help. Any questions or comments about the season? Leave us a comment! For those who have not seen and have the opportunity to attend do not miss this chance. I've seen these plays in other cities but never-in Seattle. I can't wait for the next season to come! Only a few days left until we open the season on August 4 with TURANDOT!